The excellent surf action from the early part of the week has given way to 20 to 25 knot Southeast winds and 5 to 7 foot seas. The winds are forecast to back off on Friday evening and hopefully we can get back to the beach on Saturday. As far as the last couple of days, I cancelled my scheduled charter on Wednesday due to the high wind forecast. I took a ride up to the beach to hopefully rake some sandfleas and was surprised to find the beach almost fishable. The beach that I had been fishing in the middle of Hutchinson Island was too rough to fish or rake sandfleas so I took a ride north and was shocked to find the parking lot at Middle Cove empty. If anyone has fished this beach in the past couple of weeks you know the crowd it has been attracting and finding a spot to fish has been tough. I took a couple of rods and sandflea rake and headed up to the surf line. I threw a couple of rods out in a building easterly wind and I guess the pompano and whiting didn't read the marine forecast. I was lucky enough to beach 20 nice pompano and a half a dozen whiting in a couple of hours. The winds finally got too sporty and I packed it in but what a great bite. A 10 to 15 knot easterly wind will create conditions that are favorable for the pompano to feed. The surf and wave action stirs up the bottom and uncovers the crabs, clams, and sandfleas that this fish loves to feed on. The pompano hit both plain EZ Flea Fishbites and natural sandfleas tipped with small pieces of Pink Shrimp and Pink Crab Fishbites. Its anyones guess where the pompano will reappear after the wind subsides but look for clean water and that area should produce. Bluefish, mackerel, whiting, croaker, jacks, and blue runners will be in the mix also. The inshore fishing has been good the last 3 or 4 days. Tons of sheepshead around just about any structure you can fish. Same for the black drum. The snapper have been along the channel edges and are taking small live shrimp. There are still catch and release snook around but most have been on the small side. They have gotten a few reds along the docks of North Indian River Dr. The macks and blues have been at the jetty and in the surf. In the surf there has also been whiting and pompano. Surf/Pier- Surf fishing remains very good, with a mixed bag of fish are being caught by those putting the time in. Bluefish, Spanish Mackerel, jacks, and spinner sharks are scattered up and down the beach. Tossing a large silver spoon or big popping plug is a good way to find them. Pompano fishing remains a bit spotty south of Jupiter Inlet. If pompano is the desired species...head north. Good numbers of blacktip sharks around if your looking for something bigger to pull on. The early winter surf fishing continues to be excellent along local beaches in our area. The current forecast is for some pretty sporty weather Thursday and Friday but once this system gets through conditions should bounce right back. Bluefish, mackerel, whiting, jack, blue runner, croaker, and of course pompano were active the last four or five days. As has been the case the last couple of weeks, the bite was spread from Fort Pierce to Jupiter. The bluefish and mackerel bite has been excellent from dawn to 9 am every day. Spoons and top water plugs are providing non-stop hook ups during this time frame. Randy and I fished up near Fort Pierce Inlet on Sunday and he had a ball casting a spoon to one mackerel after another. I fished Bridge Road on Monday and the bluefish were bending rods up and down the beach. After the sun gets up, a chunk of mullet fished on a fish finder rig will get strikes all day. The best whiting and croaker reports I received came from Santa Lucea, Stuart, and Tiger Shores beach accesses. Coconut, Blue Heron, and Middle Cove beaches produced some great pompano action. The afternoon bite from 3 to 5 pm has been on fire and recreational limits are being caught by a lot of folks. I fished with my wife Deb one afternoon and we had our twelve fish limit plus in a little over two hours. 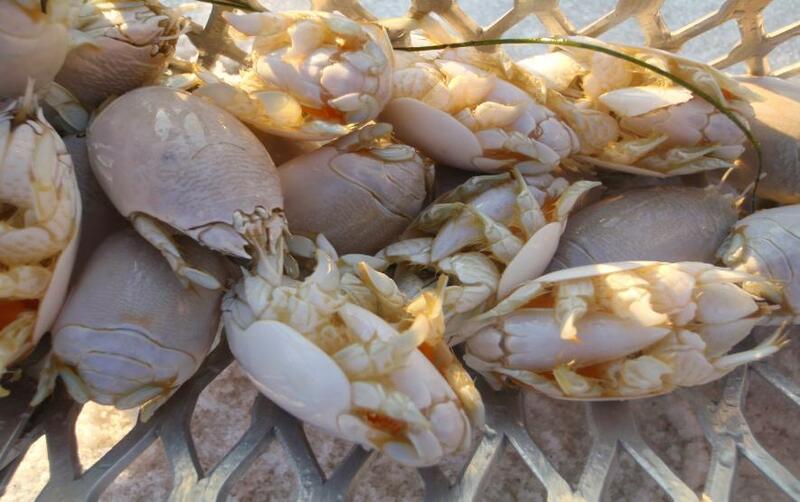 EZ Flea, Pink Crab, and Orange clam Fishbites, along with some live sandfleas were the baits that proved successful. Remember, if you aren't getting the pompano, you probably are not reaching them or you are fishing in the wrong color water. I do not take my rods off of my truck until I take a look at the surf conditions. 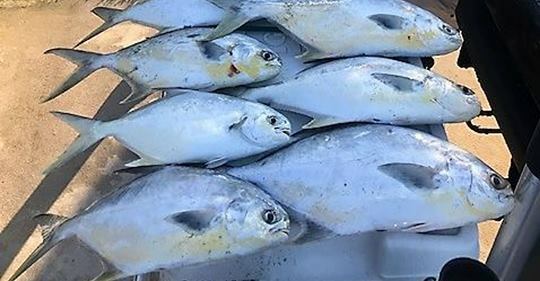 Dirty water will not produce pompano bites. Find the "clean green" or "powder blue" color and you will most likely find the pompano. I strongly recommend a long rod in the twelve-foot range along with a reel like the Penn Spinfisher V Long Cast to put you in the game. If you want to catch them you have to reach them. I will be doing a Pompano Seminar sometime during the month of January at Bass Pro Shops. I do not have the exact date but once it is set I will post it here. This is the largest attended Seminar of the year and I cover everything from tackle, rigs, baits, locations, casting techniques and recipes for those of you that will be attending. In the Indian River and along the beaches in Jensen the pompano bite has been fantastic. Anglers using Doc’s Goofy Jigs and small bucktails are catching their limits working the Hell’s Gate, Sailfish Flats and Crossroads areas of the Indian River. On the beaches, clams combined with Fishbites have been working well. There are still black drum being caught by anglers working the channel edges, docks and bridges along the Indian and St. Lucie Rivers. Some good size snook are being caught along the seawalls up in the St. Lucie River or fishing at night. 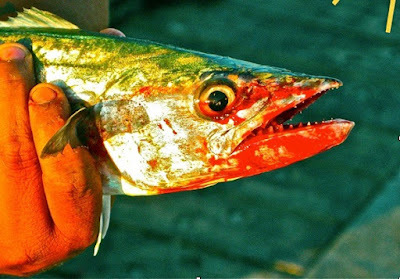 The Spanish mackerel bite is still on fire in the Peck’s Lake area. Asked how the action was for them, one charter captain joked “as much as you want.” Using Gulfstream Flash Minnows or white and chartreuse mackerel tubes has been working well recently. Along the beaches north of the Boynton Inlet large jack crevalle have been chasing bait schools. Surf fishermen using large blue/silver popping plugs are having a blast catching and releasing fish up to 20 pounds. 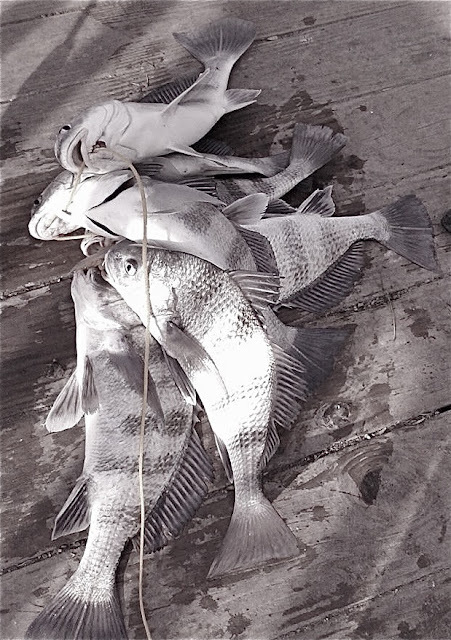 Sheepshead and mangrove snapper have been hitting live shrimp around both jetties at the inlet. Lantana Bridge anglers have reported catches of sheepshead, mangrove snapper and a few sea trout using live shrimp. With the cold weather the bass fishing has been a bit slow That should change as the temperatures come up over the next few days. The bite will be best from mid-day on as the water warms up a bit. For hot spots, fishing on the southern end of the lake was excellent for the Roland Martin Marine Center tournament last weekend. Anglers using white swim jigs were having the most success. Also, the Harney Pond area has been good recently flippin’ and pitchin’ creature baits. The crappie bite in the Kissimmee River has been hit or miss the last week. Anglers fishing in depths of 4 to 8 feet are having the best luck. There has been good action on largemouth and peacock bass, black crappie, bluegill and clown knifefish. The bass bite has been good early in the morning using Storm top water popping plugs in blue/orange or green/yellow patterns. Switch the Gambler or Bass Assassin twicthbaits or swimming shad in gold shiner, pumpkinseed or cane toad colors later in the day. Minnows or small shad fished on 1/8 to 1/4 oz jig heads have been producing crappie and clown knifefish in the deeper areas of the lakes. Fly fishing for bluegill, stumpknockers and smaller bass has been fun using Bumble Bee poppers, gnat flies and 1/2″ long epoxy minnow flies around grassy shorelines. Anglers working the beaches in the Jensen area are having an absolute field day catching pompano. They are hitting on sand fleas, clams and sand flea-flavored Fishbites combined with clams. 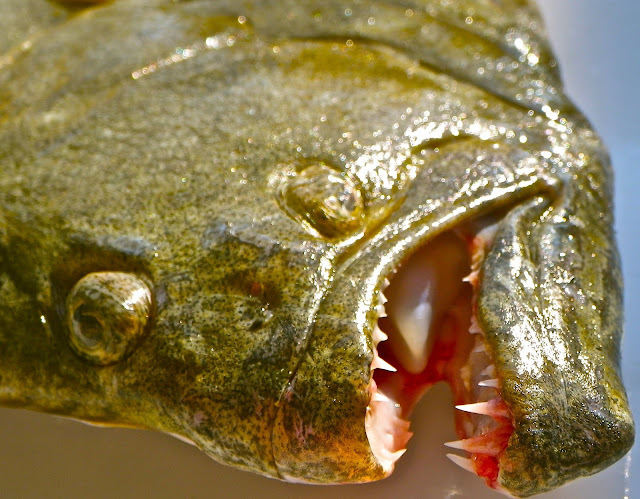 Many anglers are easily catching their limits. In addition to pompano, there has also been good action on whiting. Looking for some Spanish mackerel? Head over to Peck Lake. It’s loaded right now. A shop owner reported that two commercial fishermen, using two rods, brought in 1,300 pounds on Tuesday. Along the beaches in Jupiter there has also been a good Spanish mackerel run going on. They are being caught on Clarkspoons, green and chartreuse glass minnow jigs and silver Got-Cha lures with single hooks. The bluefish are running, especially in the Hobe Sound area. They are being caught using spoons. In the Loxahatchee River there has been a decent redfish bite. They are being taken by anglers working the bridges and docks. Around Peanut Island, the docks near The Sailfish Club and just inside the Lake Worth Inlet there have been good numbers of jack crevalle, sheepshead, some small barracuda and tarpon. Best bets are live shrimp. From Lantana Public Beach down to Ocean Ridge Hammock Park, surf anglers have reported catches of pompano, permit, and whiting while fishing both live and cut shrimp, live sand fleas and small crabs. Sheepshead up to eight pounds are being caught on live crabs around the north jetty of the Boynton Inlet. Mangrove snapper and snook have been hitting live shrimp at night. There have been jack crevalle, sheepshead, mangrove snapper and small sharks being caught around the Lantana Bridge. 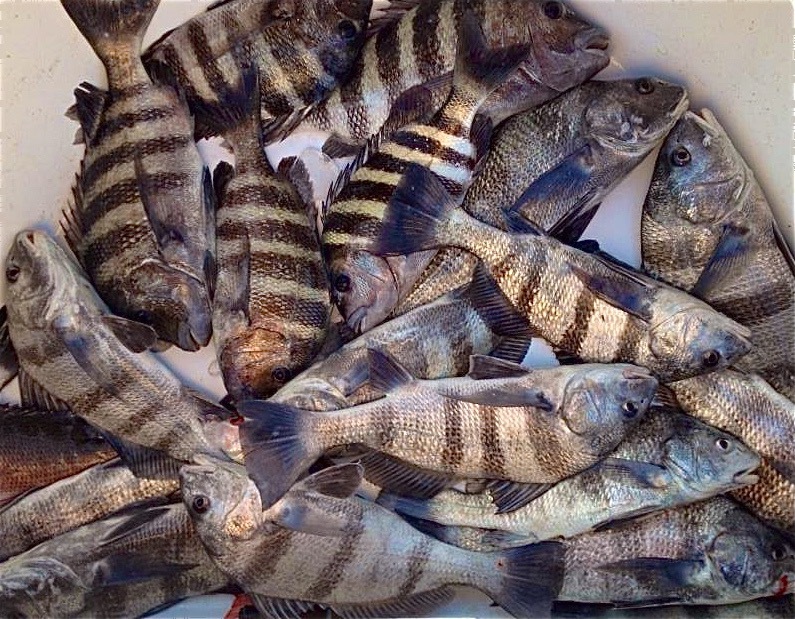 The sheepshead are being caught using oysters, clams and small crabs. Cut mullet and chunks of jacks have been producing the sharks. The bass bite has been decent lately with live shiners definitely working better than artificial baits. The King’s Bar area to Tin House Cove has been best. 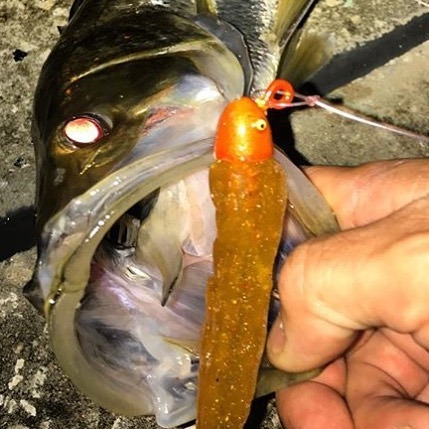 The spec bite has been good in the Kissimmee River at night with minnows working well. Along the rim canal there has been a good bite for bluegill and cichlids. Freshwater anglers have reported catches of clown knifefish, peacock bass, sunshine bass and largemouth bass using both live shad or shiners as well as artificial lures in Lake Osbourne, Lake Ida and the major adjoining canals. Fly fishing black/chartreuse poppers or casting loud surface plugs around the shorelines have been producing explosive hits by the bass averaging two to four pounds. Fishing the afternoon with slow moving jerk baits, worms and crawfish jigs have also been producing some nice bass. 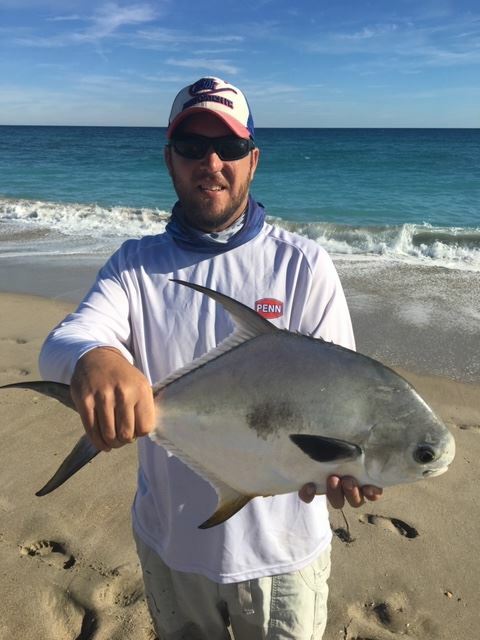 The big pompano bite that we were experiencing last weekend and in the early part of this week has definitely slowed down, but fish are still being caught along our local beaches. Recreational limit catches were the norm this past week and with another front making its way into our area this evening look for the pompano action to pick back up in the next few days. The whiting, croaker, mackerel, and bluefish action is pretty good from Ft. Pierce to Hobe Sound. I fished with my son Randy this morning and we were lucky enough to put together a limit catch of pompano, but the bite was very slow. In between the pompano bites whiting, croaker, and mackerel kept us hopping from rod to rod. 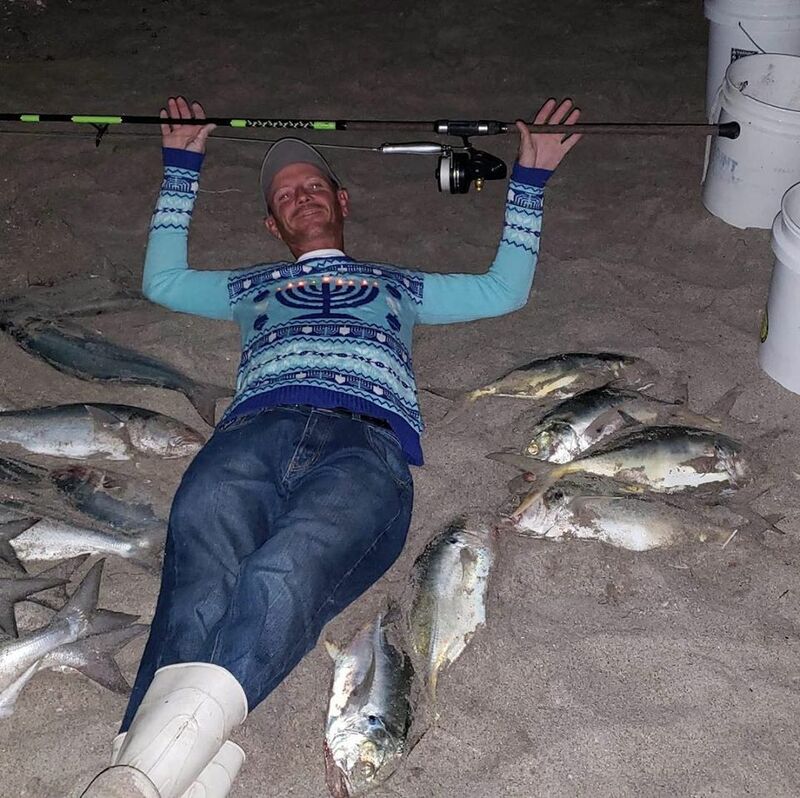 All of the fish were taken on the long rods from 70 -100 yards from the beach. EZ Flea and Green Crab Fishbites, along with some live sand fleas produced all of the strikes. I am seeing some folks using 2 and 3 ounce pyramid sinkers on their pompano rods but with the current wind and current conditions present, the 4 ounce pyramid, or 4 ounce spider sinker should also be in your assortment. If your baits are being dragged along the bottom due to current and wind, you are reducing your chance of putting together a good pompano catch. This fish prefers a stationary bait presentation so make sure you are holding the bottom. 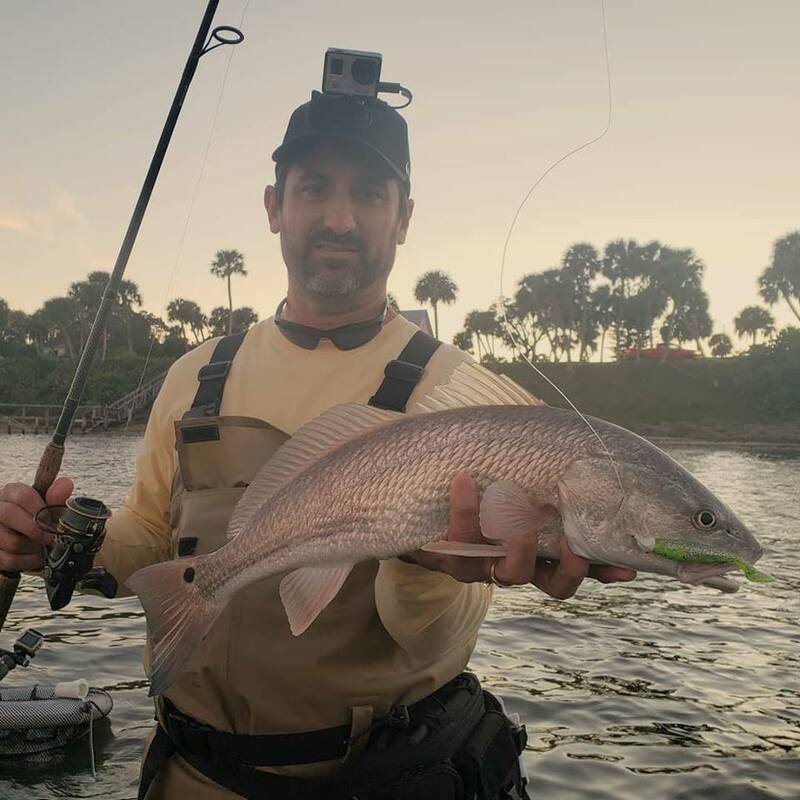 Bite detection is another factor that contributes to a successful day and by keeping your line tight from the tip of the rod to entry level in the water will allow you to stay on top of the bites. Remember, pompano have the tendency to pick up your bait and swim towards the beach after the hook up. A slack line usually means you missed one or you currently have one on. Good luck this week and catch em up. The temperatures have cooled off but the last few days of pompano fishing is red hot. 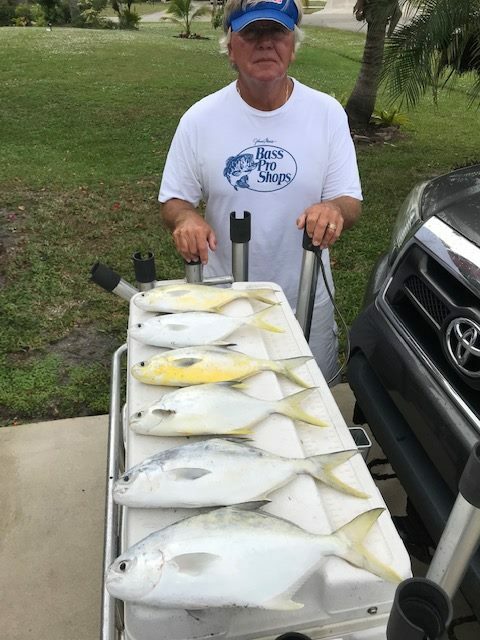 I fished at Bridge Road in Hobe Sound on Monday morning and ended up at Middle Cove in the afternoon and ended up with a big pompano catch from both locations. These are nice fish in the one to two pound range and limit catches are the norm not the exception. 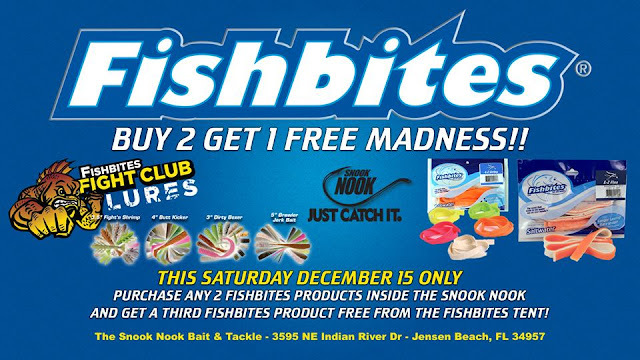 As usual EZ Flea Fishbites is the hottest scent that are catching these fish with Orange Clam and Pink Shrimp also producing..Natural sandfleas are also producing bites at all locations. Yesterdays action was as good , if not better than Mondays bite from all the anglers that I spoke with. Tiger Shores and Stuart beaches along with Middle Cove all produced action yesterday. Anyone looking to throw some spoons or hard baits should head to to Hobe Sound as the bluefish, jacks, and mackerel were being caught all morning in that area on Monday. I fished up by Fort Pierce Inlet this morning and put pompano up to 3 pounds in the cooler along with some big whiting before the wind and waves chased me off the beach. The winds are forecast to back off the next couple of days so pick a beach and get in on this great fishing. We’ve seen a bunch of folks successfully fishing for Flounder during multiple Inlet visits this week so get out there! Winter conditions have been mild so far in December. We have had a few cold days, but overall it has been very good weather. We can expect our weekly cold fronts to move through and cool things down for a few days. 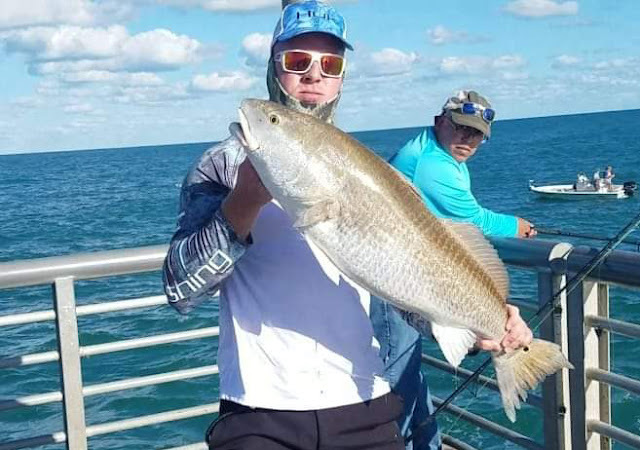 Water temps have been in the mid seventies and that helps bring in the winter fish and plenty of action for anglers on the Treasure Coast. Enjoy the fishing this month! I am seeing pompano, sheepshead and mackerel arriving every day. It's always good to see these fish coming into the river again. Look for mackerel around the inlets and turning basin hitting small shiny lures. Drum and sheepshead have been plentiful around docks, bridges and channel edges. 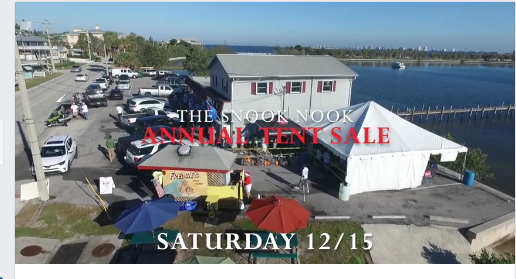 Snook have been around the inlet areas as well as bridges and docks. 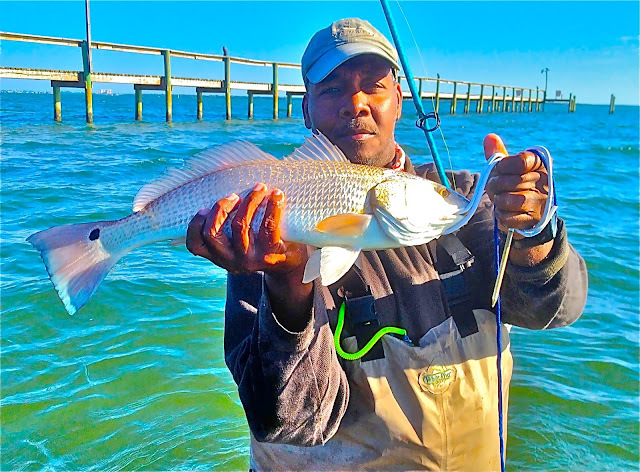 Redfish on the flats and mangroves can be found with DOA shrimp. 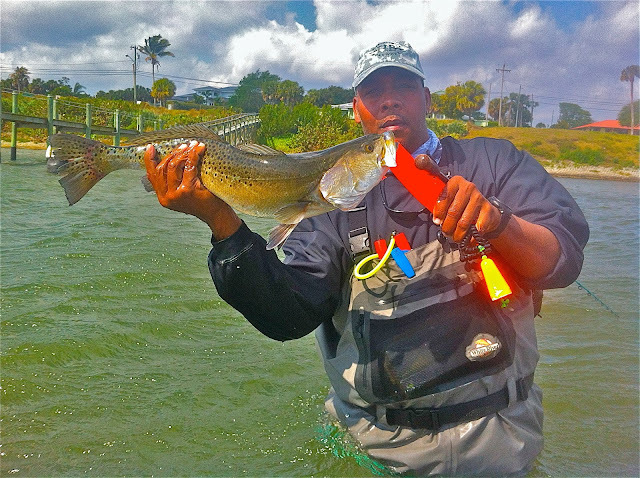 The trout bite has been improving north of Fort Pierce on the grass flats towards Harbor Branch and Queen's Cove. DOA Deadly Combos are great tools to find the trout. Pompano have been scattered, but more are arriving every day. It should be a good pompano season this year. Jacks, ladyfish and blue runners have been thick in the channels and inlet areas. If your just want some rod bending action, especially for the kids, get out and enjoy the fishing this month! Warm temperatures, nice surf conditions, and a whole bunch of fish traveling up and down our beaches made for a great Sunday in our area. 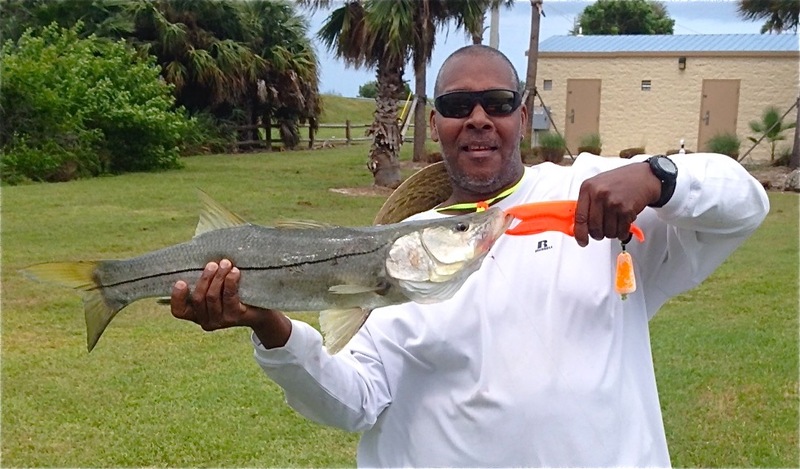 I fished with my wife Deb, my son Randy and the rest of his family, and we were running from rod-to-rod all day. Whiting, mackerel, bluefish, ladyfish, blue runner, and lots of nice sized pompano kept us busy for the entire time we were on the beach. 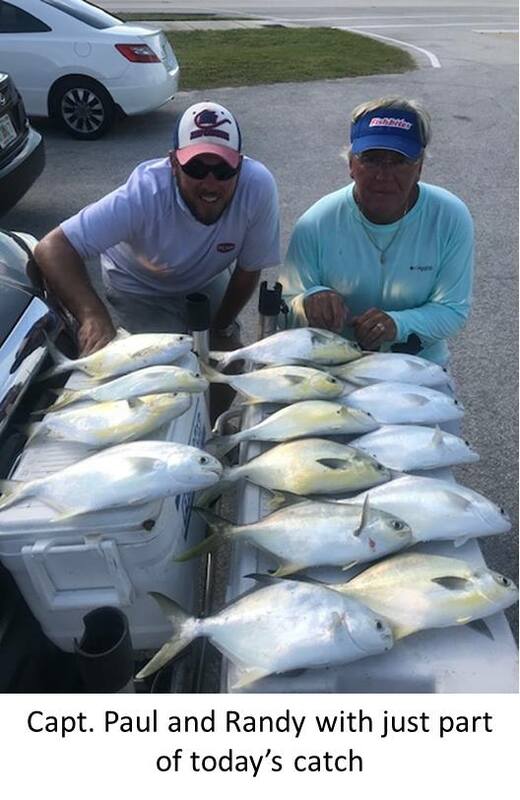 The highlight was the abundance of keeper sized pompano! 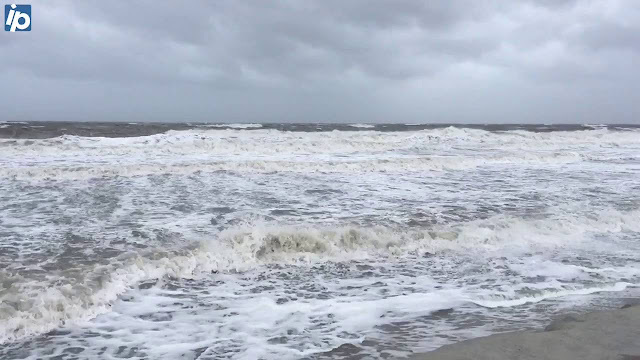 That action was not only at Middle Cove and Blue Heron Beaches to the North, but also on the Hobe Sound beaches to the South. The key to the pompano success is using the right equipment that allows you to reach the second trough where these fish are located. 12-foot rods with Long Cast Spinning reels or conventional reels like the Penn Squall 15 will put you in the right zone. EZ Flea, Orange Clam, and Pink Shrimp Fishbites were the hot artificial baits, while blanched sand fleas also produced numerous fish. The stage of the tide didn't really make any difference today as the bites were continual. When you have this many species in the strike zone, make sure you have enough cut Fishbites and sandfleas ready to use in your bait bucket as you will run through them quickly. The next couple of days look great as far as surf conditions and with this last body of nice sized pompano having moved down the coast, the surf action should be great. One of our customers caught a 22 inch flounder at the jetty on Saturday. 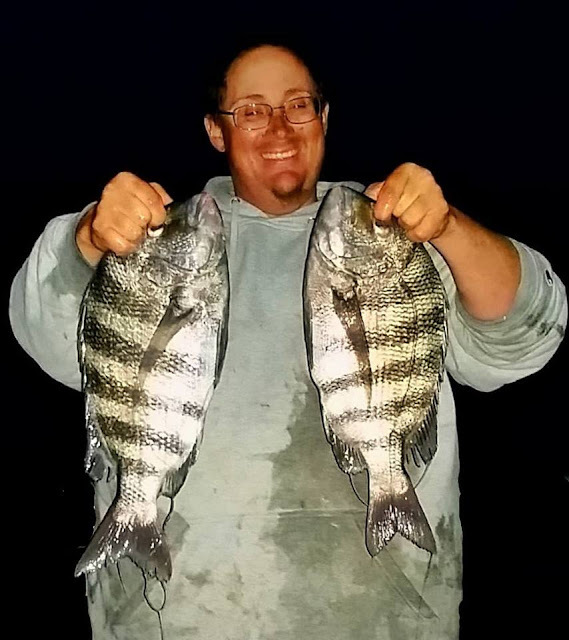 More reports about the black drum bite. They are along the channel edges and around the docks along South Indian River Dr. 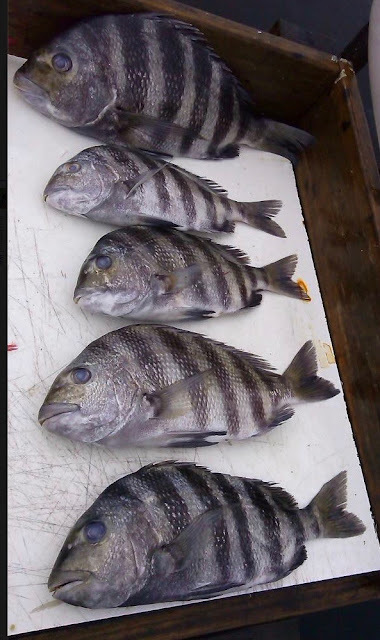 The sheepshead are in the same areas in good numbers too. The snook are in the Inlet on the tide changes. 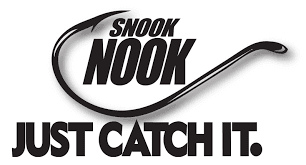 Just a reminder - snook season will be closed from December 15th to February 1st. Still some small pompano in the surf to the south if the Inlet.